For physicians who prefer to dictate their notes, Modernizing Medicine®’s EMA EHR system offers the latest Dragon Medical Speechkit technology to capture your voice effectively as you talk naturally and at your own pace. With a robust medical vocabulary, voice commands and HIPAA-compliant speech recognition, EMA with clinical voice recognition powered by Nuance Healthcare speaks your specialty’s language, allowing you to work three to five times faster than typing. Like our EMA EMR system, Nuance Dragon is cloud-based. That means there’s no software for you to install or configure—our team handles most of the work for you, and with just a few clicks, you’re good to go! If you have any questions or encounter any issues, our dedicated Modernizing Medicine team is there at every step to keep you running smoothly. Cloud-based speech means you’ll have access to the latest medical vocabulary, terms, phrases and clinical formatting rules. Organizations and individual users can also customize their personal medical vocabularies. Visual indicators tell you where speech is enabled and when audio is being captured, as well as displaying audio recording levels, to ensure a seamless experience. Speech-related data is communicated with 256-bit encryption channels designed to provide end-to-end security. Individual user speech profiles are sharable across select mobile, web and desktop applications with Dragon Medical speech recognition by Nuance. 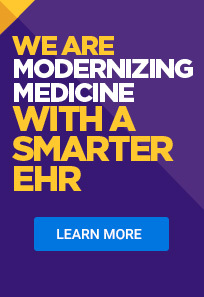 Right out of the box, EMA equips you with specialty-specific medical wisdom, automated coding and a clean, responsive interface to improve efficiency and outcomes. And by speech-enabling EMA with state-of-the-art Dragon Medical Speechkit dictation software, powered by Nuance Healthcare, you can effortlessly translate your voice into rich, detailed clinical narratives. This, in turn, shifts the paradigm even further away from time-wasting data entry and toward a new era of patient-centered care. With a speaker-adaptive engine, built-in visualization and feedback and anytime, anywhere access, you can rest assured that clinical information is accurate and up to date. Your documentation, your workflow and your voice—all captured, coded and understood right within EMA. What types of information can I capture using the Nuance voice recognition software? With Dragon Medical speech recognition by Nuance, you can effortlessly dictate notes in any free-text field of EMA, from additional notes to clipboard details and more. Structured data components can be captured in a few taps with EMA’s simple touchscreen interface. Submit the form below to learn how EMA with Dragon Medical speech recognition powered by Nuance Healthcare is the most powerful electronic medical records system on the market today.